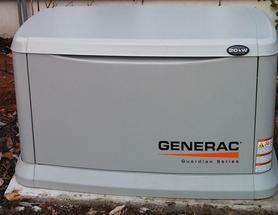 Since power outages are becoming more frequent, you may want to think about the installation of a Generac generator. We'll install a system that meets your needs, as well as your budget. Generators provide a seemingly uninterruptible power supply to your critical loads which could include: general lighting, heating and air conditioning systems, water heaters, refrigerator/ freezer, sump-pump, etc. You just sit back and relax while the stand-by generator senses a utility loss and starts simultaneously to restore the power in your home. These units are fueled by natural gas or propane. Whether you are looking to utilize everything in your home, or just a selected amount of circuits, we have you covered. Generac generators have the ability to achieve either situation depending on the electrical load you choose. Service-rated transfer switches are designed to tie-in to your existing service panel and serve as a main breaker for your system. These units can either be mounted indoor or outdoor depending on the situation. Another method is to use a load center which is manufactured with 12-16 circuits. These switches are used in situations where you may only want the generator to operate a selected amount of circuits during utility failure. Either way, we have you covered. In some cases, a portable generator can be installed as well. Please call or email us with any questions that you may have.